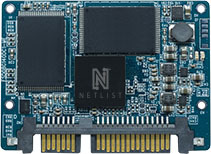 Netlist’s Half-Slim form factor solution delivers all the advantages of Solid State Drive technology based on SLC, pSLC and MLC Flash technology in the industry’s standard JEDEC MO-297A form factor solution. Actual performance may vary on system configuration, environmental factors, memory capacity utililzation, operating system. Sustained Read/Write performance can be affected by many factors such as test benchmarks used, file size NAND configuration, NAND type, and total storage capacity. Higher capacity modules will typically have higher Read/Write performance. For additional information, call us at (949) 679-0100 or email info@netlist.com.